Kim Jong-Un shares his love of basketball with a trusted, life-long protector who's been more friend than bodyguard. 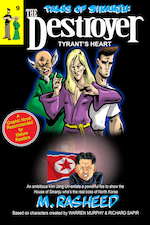 Upon the death of Jong-Un's father, the mysterious figure seems to gain his own ambitions, and now his young boss has become top dog of North Korea. The newly-crowned Supreme Leader of the Democratic People's Republic of Korea immediately declares war against the USA, and a certain tiny fishing village on the West Korea Bay! Suspecting a trap, Dr. Smith sends Remo after Jong-Un, but will the Destroyer arrive in time to save his adopted home...or avenge it?